Direct reprogramming of cells (also called direct cell-fate conversion) is where one fully differentiated cell type changes directly into another. In the past, researchers thought this was impossible, especially for generating human neurons. Now it has been shown to be not only possible, but also potentially simpler than other methods of creating neurons, such as creating induced pluripotent (iPS) cells to be subsequently differentiated into neurons. Researchers at Washington University have shown that, by using a combination of factors, human adult fibroblasts (connective tissue cells) can be directly and reliably converted into specific types of neurons in tissue culture. When engrafted into a mouse brain, these converted neurons are able to survive and integrate into the existing brain circuit. In Huntington’s Disease a specific type of neuron called medium spiny neurons are damaged or destroyed. So, being able to make medium spiny neurons is an important research tool for modelling the disease and offers promise for potential therapies in this area. Disease modelling is a research technique where, for example, a culture of cells that are ‘like’ the disease being studied are used to investigate the disease and test potential therapies. Human Fibroblasts stained with the neuronal marker MAP2 (red) and the nuclear marker DAPI (blue) before reprogramming. The absence of red marked cells signifies that despite many cells visible there are no neurons. When adult cells are transformed into iPS cells, they revert to an earlier state, similar to the embryonic state – so they lose the markers that make them adult. For the study of genetic diseases that only occur in later life, like Huntington’s Disease, this is not ideal: the embryonic-like iPS cells do not functionally suffer from the disease, even when re-differentiated into the affected cell type. Direct neuronal conversion provides a potential solution to this issue as cells are not induced into pluripotency, but instead change from one adult cell type directly to another. Treating the cells with specific transcription factors and, in this study, microRNAs, causes the cells to simply switch from one cell type to a specific type of human neurons. This can be an improvement over the iPS technique, as iPS cells typically have very low rates of reprogramming. Cell lines created from iPS cells can also be unpredictable in terms of how they will differentiate; different cells from the same line can express different genes. The same can be said, in fact, of any stem cell culture – unwanted differentiation can destroy a culture. This is not a problem in directly converted cells, as the conversion is directed towards a specific cell type. The ability to cause cells to change their cell type may hold much potential for research and therapy development. 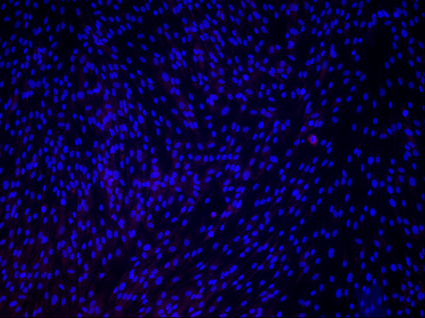 Reprogrammed fibroblasts (30 days later) stained with the neuronal marker MAP2 (red) and the nuclear marker DAPI (blue). 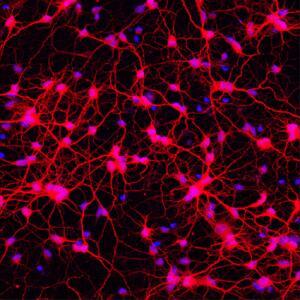 The presence of red marked cells signifies the cells have become neurons. In this study, researchers showed it was possible to create a cell type called medium spiny neurons directly from human fibroblasts using a combination of transcription factors and microRNAs. MicroRNAs are short pieces of RNA that do not make protein, but instead perform many functions within the cell, including switching genes on or off. Two microRNAs, miR-9/9* and miR-124, are known to be critically involved in directing cells towards neuron development. These microRNAs and four transcription factors – CTIP2, DXL1, DXL2 and MYT1L – were used to treat human adult fibroblasts and successfully transform them into medium spiny neurons. In a sample of 405 cells, after treatment, 82% expressed the MAP2 gene, a gene which identifies cells as neuronal, and the majority also expressed other genes which revealed they were medium spiny neurons. What did this study show? Once the converted medium spiny neurons had been created, they were transplanted into the striatum of mouse brains to test if they were functional. The striatum is the middle part of the brain; it is the neurons here that are affected by Huntington’s Disease. Once in the mouse brains, it was found that the medium spiny neurons were able to successfully survive within the mouse for at least three months, and some were still alive after six and a half months. When compared with the mouse’s own medium spiny neurons, the transplanted cells performed similarly, unlike in previous studies where the transplanted cells were non-functional. Overall, this study showed that it is possible to create transdifferentiated, fully functional human neurons from fibroblasts. Cell therapies for genetic disease hinge largely on two points: whether the cells are safe to use and whether the treatment is effective. No treatment can be successful if it does not satisfy both of these conditions. Direct neuronal reprogramming offers some potential benefits over the use of iPS cells for human therapy, but currently neither are ideal for human use, as both use viral vectors to deliver the transcription factors and microRNAs. This research uses a lentiviral vector, which integrates randomly into the human genome and increases the potential for the cells to cause cancer in a patient. More work has been done on iPS cells, and there has been success using small molecules instead of transcription factors to make these cells, but they are still unpredictable. This means that whilst medium spiny neurons made via either the iPS or transdifferentiation routes are useful for disease modelling, therapies are currently more difficult to develop. The authors conclude by stating that overall, the potential of direct conversion for disease modelling using human neurons is possibly higher than iPS cells due to being able to avoid the embryonic problem, as well as being quicker and potentially simpler to achieve. The ability to create specific cell types at any time is a step forward, and opens the door to therapeutic uses, but there are many issues that must be solved before a usable therapy can be created. This article was written by Mirren White, edited by Jan Barfoot and reviewed by Andrew Yoo. Images of Fibroblasts and reprogrammed neurons used with kind permission of Andrew Yoo.